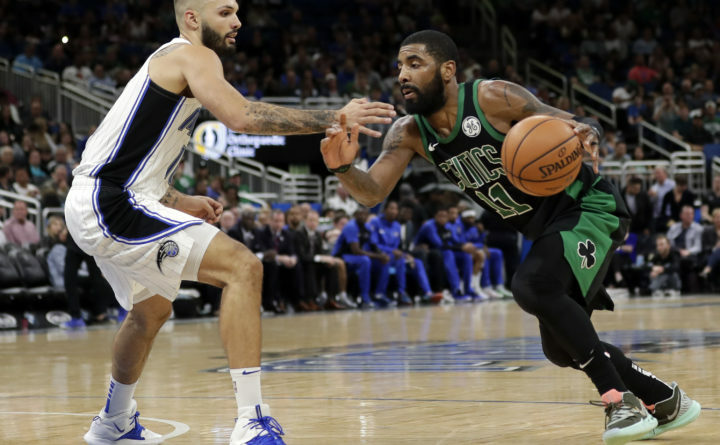 Boston Celtics' Kyrie Irving, right , drives around Orlando Magic's Evan Fournier during the second half of an NBA basketball game on Saturday in Orlando, Florida. ORLANDO, Florida — The Boston Celtics couldn’t cool down Terrence Ross in the second half and it cost them the game. Kyrie Irving scored 25 points for the Celtics, 10 of them from the foul line in the final 4:31. He appeared frustrated afterward with Gordon Hayward, who inbounded the ball on Boston’s final possession. “Obviously Terrence was instrumental there. When he gets going he doesn’t need a lot of space,” Magic coach Steve Clifford said. It was Boston’s only visit of the season to Orlando. Celtics: F-C Aron Baynes missed an 11th straight game with a fractured finger on his left hand. … Hayward, an 88 percent free-throw shooter, missed his first three attempts. … The Celtics missed nine free throws, seven more than Orlando. … The Celtics lost the season series to the Magic for the first time since 2009-10. Magic: Rookie C Mo Bamba, who missed a second game with a sore left foot, hopes to return by Wednesday. … Khem Birch, who played 18 minutes in place of Bamba, had 10 rebounds and four blocks. … The Magic have followed their season-high, four-game losing streaks with wins over San Antonio, Toronto and Boston.